As stated here, the color for highlighting right and wrong are same. 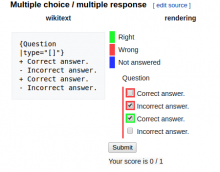 If Incorrect answer is submitted in the following quiz, the quiz will then have 3 options highlighted in the same color. @Mvolz Would it be fine to give green color to correct answer when incorrect answer is submitted ? Yes, I think so, and the whole question would be highlighted red so it would still be obvious it was answered incorrectly. @Mvolz In multiple choice even if the correct answer that hasn't been selected is shown is green, it won't have tick inside input type. Or we can take another approach by defining a new color scheme. The more I think about this, the more I think this is the correct behaviour. 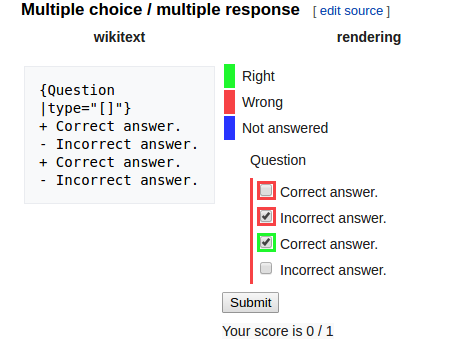 If a correct answer is NOT selected, then it should be red because it is INCORRECT, having not been selected. Mvolz removed a project: Community-consensus-needed.